It's common knowledge I will read a cookbook before all other things. I read them like novels, they are novels, they're historical fiction. They are "this is what we ate and this is how we made it delicious" books and I love them. We were invited for dinner the other day and the "grandma" was there. I love when anyone's grandma arrives, we always end up talking about food in a corner. She waxes poetic and I sit mesmerized, it's a common picture that's played out with all of my friends if their mothers happen by. I'm making it for dinner tonight, pictures will follow of course. *I think I'll like the addin chili powder. I only have a small can of tomatoes so may add some of the cherry tomatoes, chopped, that we are still harvesting in JANUARY in Texas. 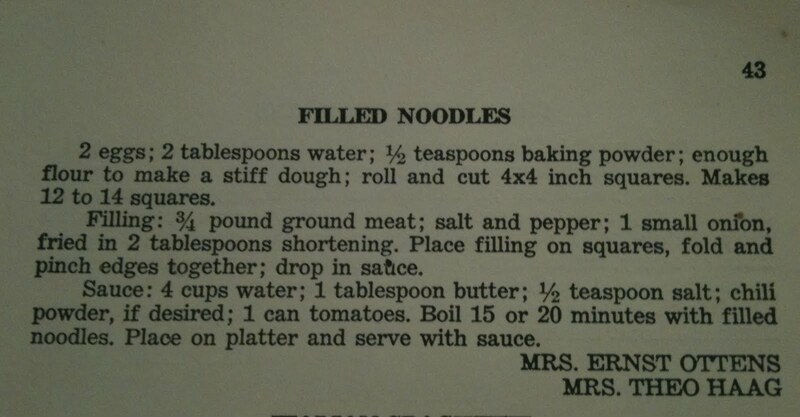 Boil the noodles in the sauce for 15-20 minutes. Place on platter and serve with sauce. That's all they wrote. 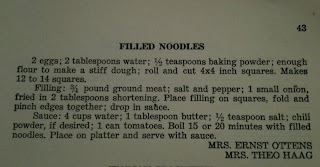 I would have thought you boil the noodles in water and transfer but perhaps boiling in the sauce will thicken it slightly from the starch/flour in the noodle. I can't wait to try it, as I said, I'll post the play by play pics later today. I'm making a couple loaves of bread at the moment, one sandwich loaf for Connor's lunch and one rustic Italian crusty boule to have with the filled noodles tonight! Well the sauce is done, I did cheat and dropped 1/4 of an onion in the sauce, just for more flavor. I'll boil it up when the noodles are being made. The filling is made and I added more onion because I love it. Just dough and dropping and boiling to do! Ok, here's the beauty shots. The dough was very easy to deal with. I used just shy of 1 1/2 cups of a/p flour to make the dough soft but easy to roll out without sticking to anything. I had the rest of the cup measure at the side of the counter and used it for dusting as I rolled. I boiled them for 15 minutes but thought they needed a little bit more so another 3-4 minutes. Husband wasn't home so I left the pot on the stove (turned off) and he ate an hour later and they were still hot and a little softer still. The final verdict? The sauce was delightful, thin and flavorful but needs the addition of more onion or spice (for my families tastes) The filling was also a little bland but then we're all exposed to so much more spice these days I'm not sure if it's the filling or our taste buds. I'll simply amp up the salt and pepper and maybe add some pork to add fat to the filling, I'm sure the ladies of the day had beef with substantially more fat and flavor that we have today. Will I make this again? Oh you betchya, it's definitely a keeper! In honor of Mrs. Ernst Ottens and Mrs. Theo Haag, I thank you. These are a hearty fare and worth the investment of energy to make. Not that there's alot of energy but some people think making and rolling any sort of dough an effort. Thankfully, I'm not one of those people and will continue to search through old cookbooks, chat to everyone's grandma and keep the recipes going that were staples when people had less, worked harder and had to make what little they had stretch further. It's my little ode to those who came before.